I’ve noticed that the display on my MOTO 360 is not quite centred horizontally and is very slightly to the left. This means that for example, for numbered watch faces (e.g, Pascual), the 9 will be right up against or even slightly under the glass bevel, whereas the 3 is fine or the left hand tick marks look noticeably shorter or are even totally under the glass bevel compared to those on the right. 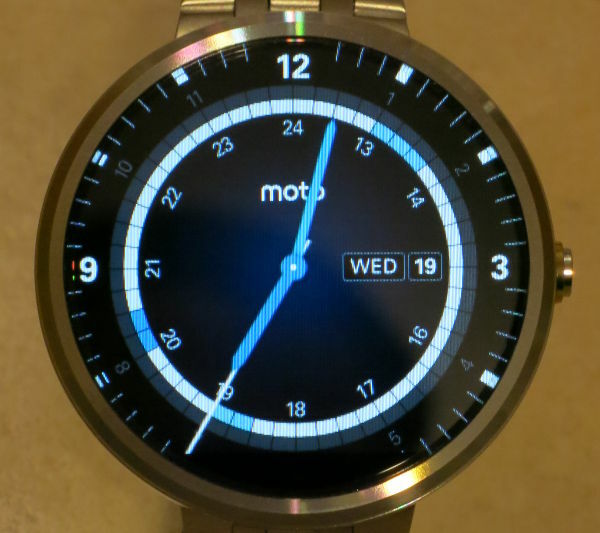 Not having seen another MOTO 360, I don’t know whether this is normal or not and it’s hard to tell from images. Now I’ve noticed it, it jars far more than the “flat tyre” . Do other’s MOTO 360s have the same issue or are your displays horizontally centred? Not normal, I would request a replacement. Can you measure from the bezel near 3 o'clock to the middle pin where the hands meet and then the distance from the middle pin to the bezel where the 9 o'clock is? What are the two distances? Measuring, the radius appears to be about 1mm more on the right than the left. This only implies that the face is ~0.5mm to the left, but the visual impact is worse the figures suggest. I have requested a replacement and will see if it's better. mine seems to be fine. unless i ma using facer and the persno who developed the face design has it off center so to check i uploaded a stock moto one and it was fine. i would contact motorola. i use their live chat for tyring to call i have waiting an hour on hold before. Received my replacement today and display is definitely more horizontally centred.